On Tuesday May 2nd we were in Georgetown awaiting the arrival of our final guests, Paul’s brother John and sister-in-law AnneMarie. 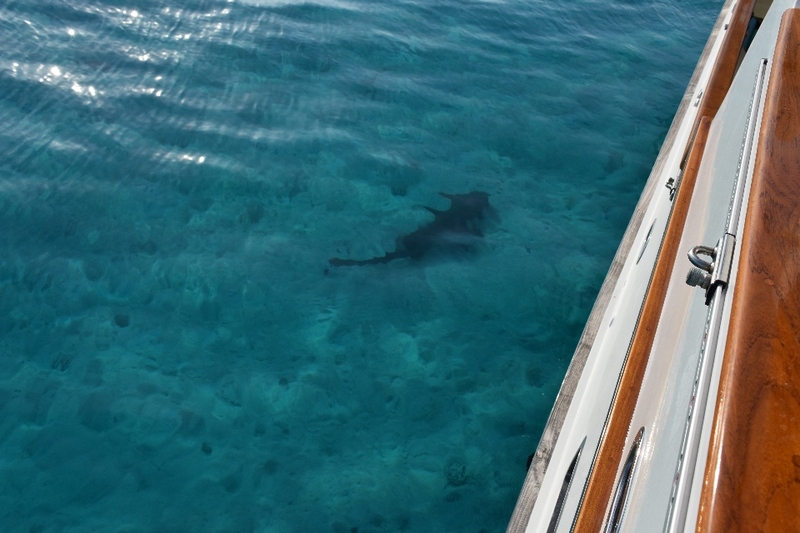 Around the time their plane was to land we went over to the Exuma Yacht Club marina for a small fuel top up, gas in the dinghy tanks, and most importantly, to fill the water tanks, which we down to less than 50 gallons and wouldn’t last a crew of four for very long. When we got there we found out that the main water pipe feeding the marina was broken and there was no water. The dock master told us it would be about 45 minutes to repair. So we loaded the fuel, got a few things from the store, and waited. In the end it took over two hours to get the water flowing – and even then it was leaking at the newly mended joint as we filled the tanks. 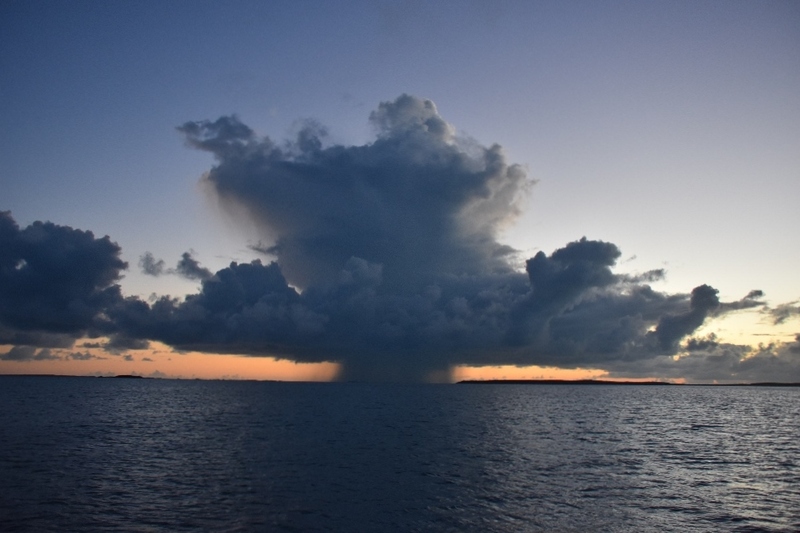 We left Elizabeth Harbour and into Exuma Sound. The winds were light which made the trip outside comfortable for once! 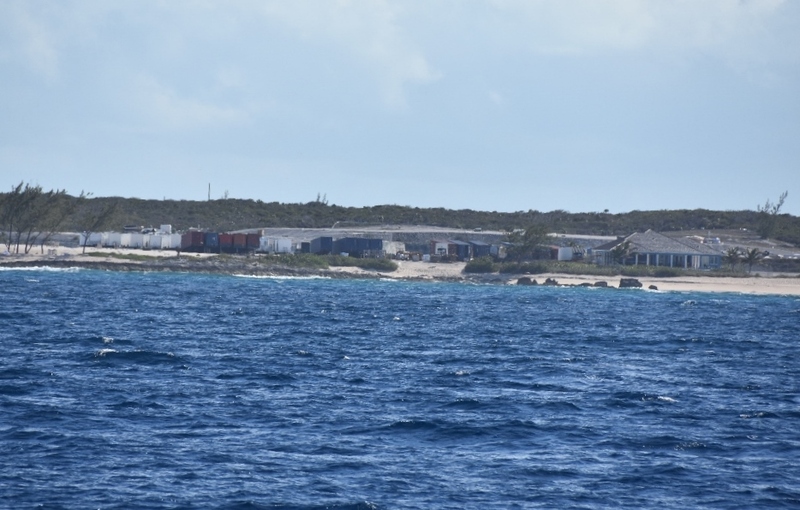 Paul took some photos of the site for the doomed Fyre Festival, with dozens of trailers lined up above the beach and work going on to dismantle the site. 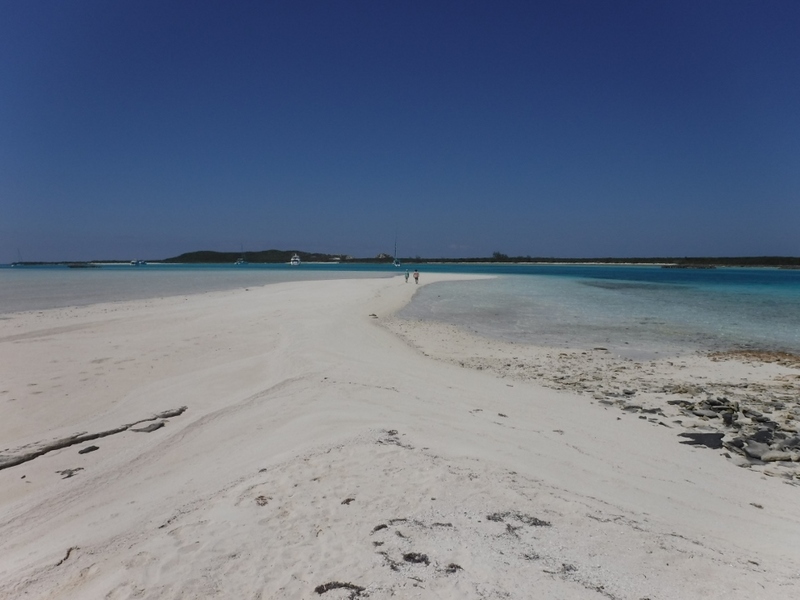 We went back into the Exuma Bank side via Adderly Cut and on to Williams Cay. We had light winds all day and evening and for the first time this trip, since March 2nd, we had to run the generator for AC during the night! Since it is one of our favorite anchorages we stayed at Williams for two very comfortable days. On the fourth we exited Adderly Cut for the short eight mile run to come back in at Rudder Cut. We then had a slow leisurely motor past Cave Cay and Musha Cay and on into Little Farmers Cay. We anchored right off the Government Dock. 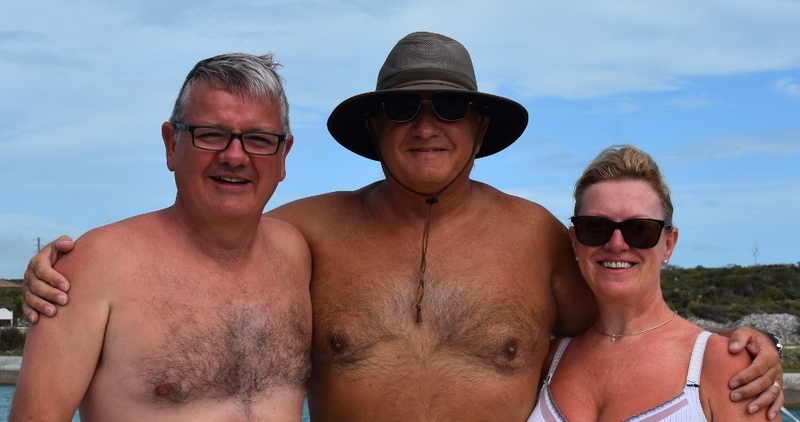 Sian, AnneMarie and John went ashore for a few things (including some more Captain Morgan and some tonic water to go with the gin)! We called the Ocean Cabin restaurant and asked what seafood they had for dinner to hear that they only had tilapia. 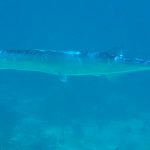 Certainly not a fish we wanted to eat here in the islands! 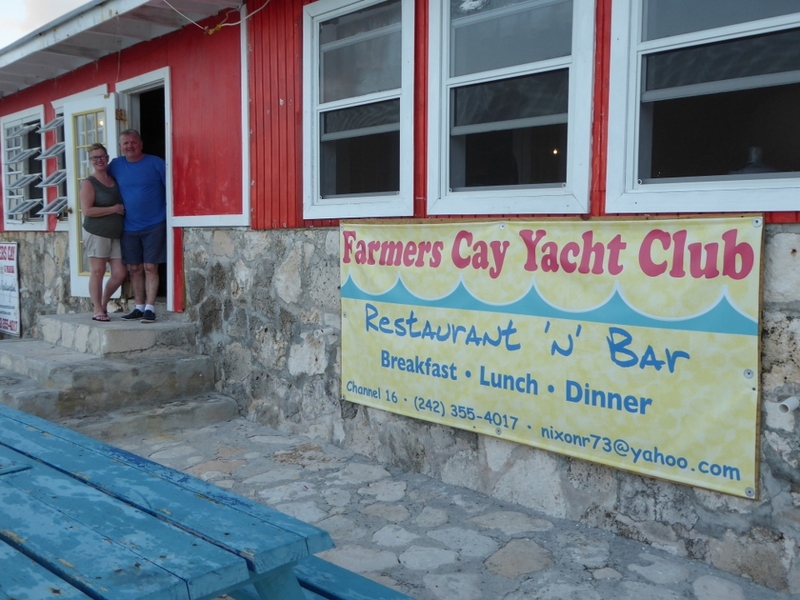 Next we called Little Farmers Yacht Club and were told that they had grouper, so we ordered four meals for 7pm. As we were eating our dinner, the only guests in the restaurant, and chatting to the owner Roosevelt Nixon, we saw a small coaster come in to his dock. 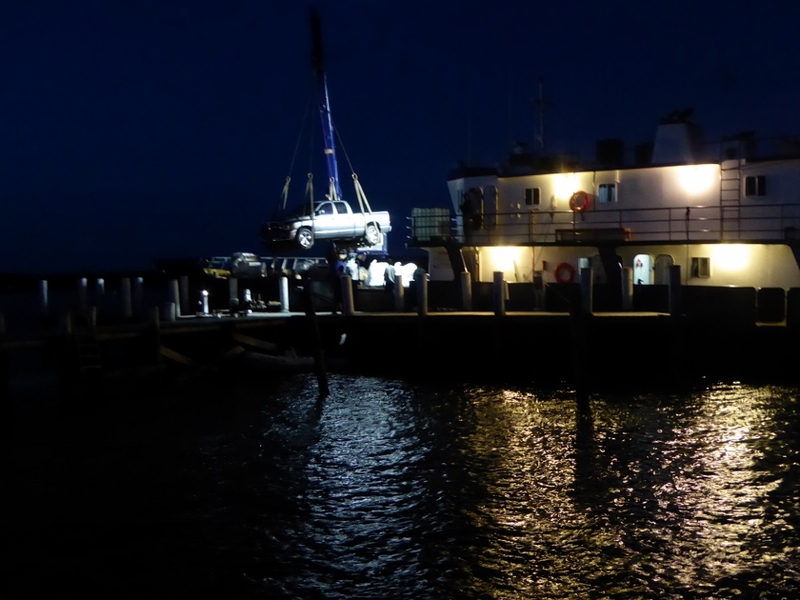 We then watched as they unloaded an F150 right onto the end of the marina and drove it along the marina and up onto the road. The process was pretty interesting – so we had dinner and a show! Someone is getting a new truck! Leaving Little Farmers we went to Big Majors Spot. Our intent was to go through the little cut to get behind Fowl Cay, since there was a swell running into the Big Majors anchorage. However the current was running through the cut pretty hard so we decided to anchor and wait for slack tide. After a couple of hours we went through and anchored in very calm conditions. 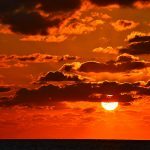 It was at this point that John looked for his wallet, which was in the pocket of his nice Musto sailing jacket, and realized that he had left it on the ground back at the Exuma Yacht Club in Georgetown. We immediately called both the marina and the nearby restaurant and they did not have it. Luckily John had kept all of his cash separately so got busy calling to cancel his cards and order new ones. 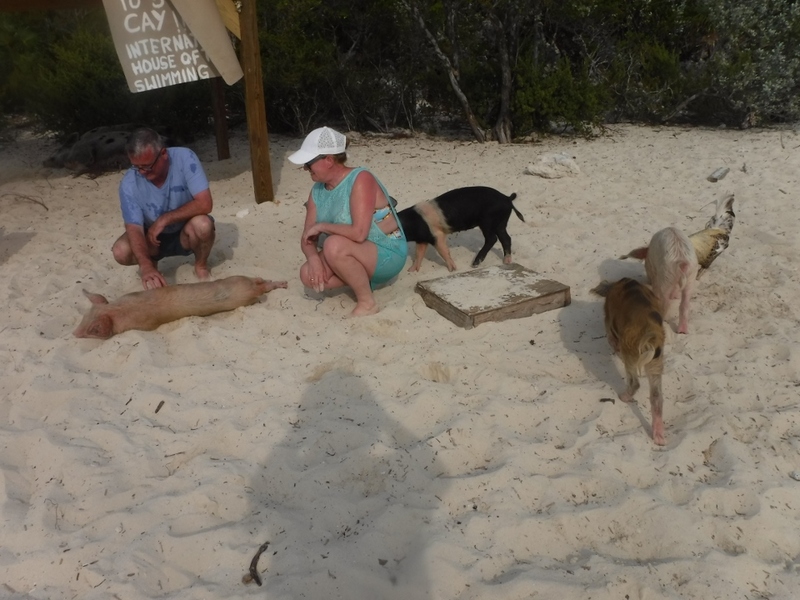 Then of course we took John and AnneMarie over to meet the pigs! Since it was May 5th and Cinco De Mayo, we made a pitcher of margaritas and sat on the boat deck watching the sunset! 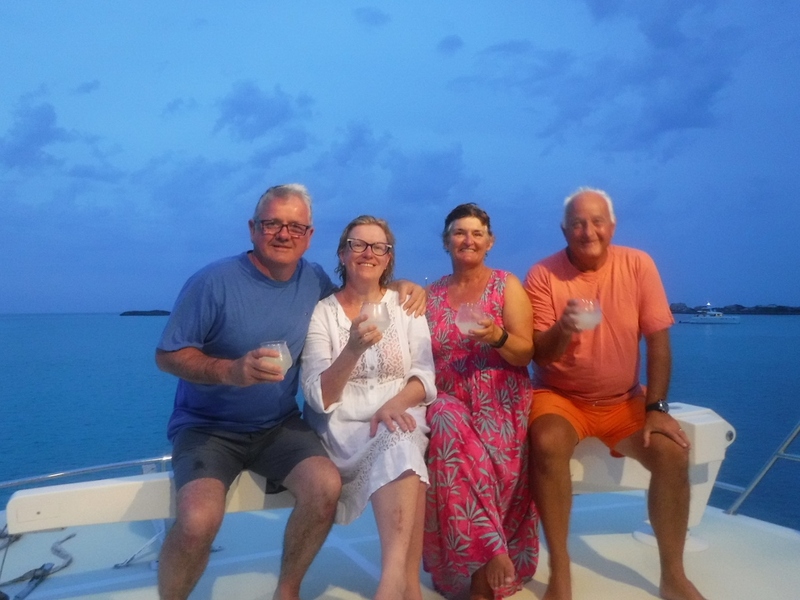 The next morning we made sure to be by the radio when Exuma Park came online to see if we could get a mooring buoy at Warderick Wells for that day – and we were successful! 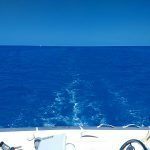 We upped anchor and headed to Warderick where we got assigned the same mooring ball as our last visit – # 17. And finally the weather changed to blue skies and very light winds – and even better it was forecast to stay that way for the rest of our time in the islands. We walked up Boo-Boo hill and John and AnneMarie continued and walked the longer trail. As we got back on board Mint Julep came into the mooring field and picked up number 18 right by us. They were on their way to Nassau to visit with a dentist as a crown needed some work. We stayed at Warderick for two days and then we warned our families back home that we would be out of communication capability for a few days. 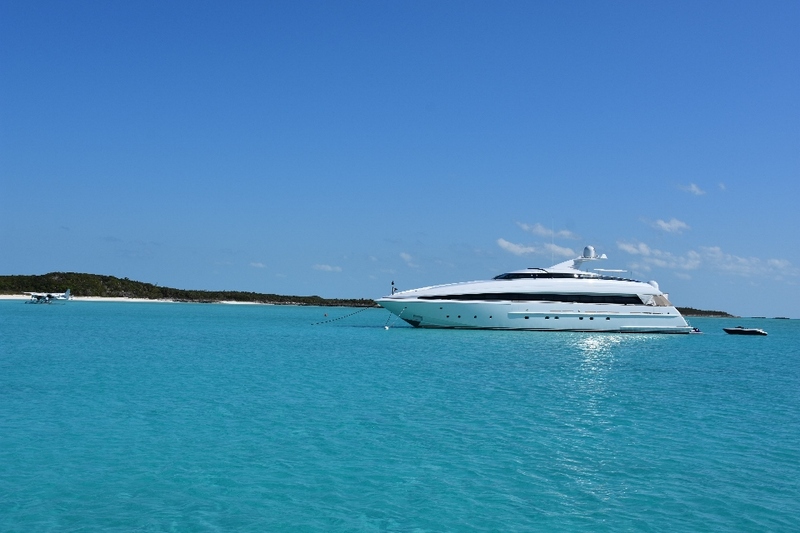 We motored north to the anchorage off the beach at Hawksbill Cay, still in the Exuma Park. The big yacht Alder was still there. Paul had a chat with one of the crew who said that the owner just wanted to stay in place for a month before heading back to Florida. We stayed there a couple of days, snorkeling the reefs, with plenty of turtles and rays surrounding the boat. 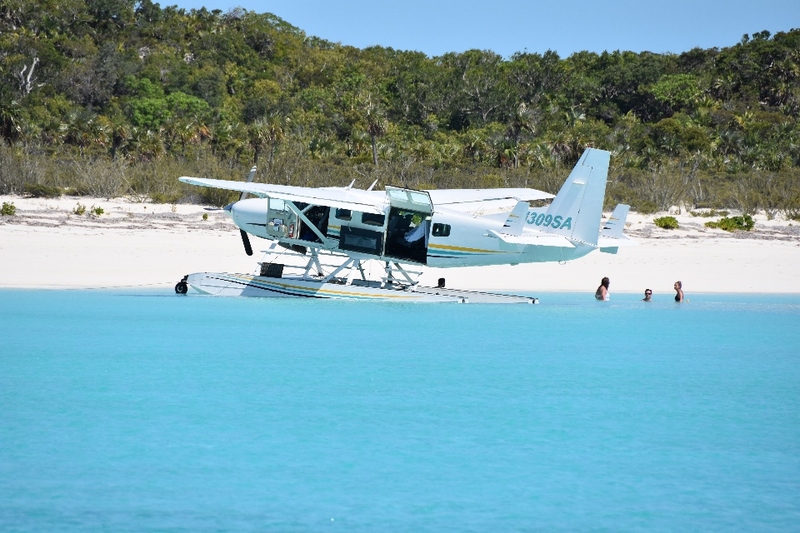 We also watched as a Seaplane came in each day and motored up on the beach to allow the passengers to play. This was as far north in the Island chain that we were going with our guests. So on Wednesday the 10th we motored down to Cambridge Cay. 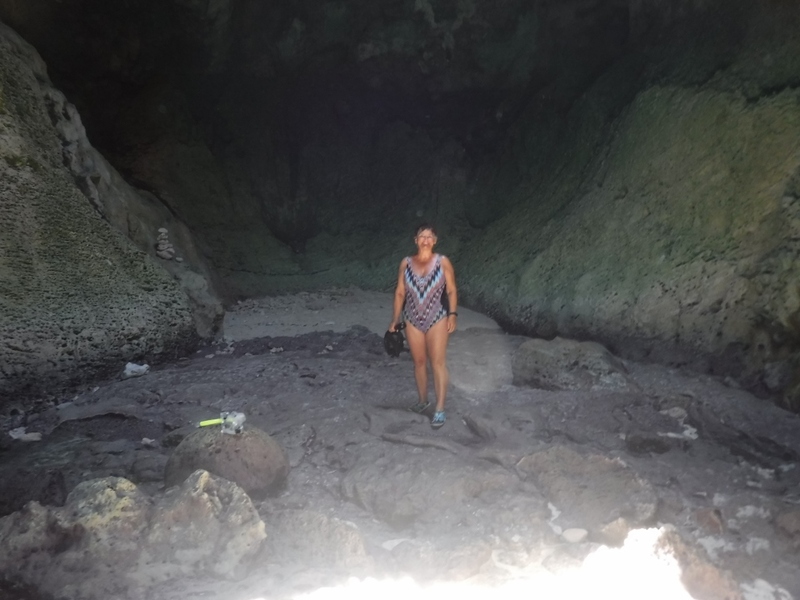 We had been told that it was easy to dinghy from there across to the small Rocky Dundas cays where there were some amazing caves. The Cambridge Cay anchorage was another simply beautiful anchorage, with long sandbars to walk on. We took Grace to the caves with us to stop her from disrupting the anchorage, barking non-stop after us as she had taken to doing. Paul and AnneMarie stayed with her in the dinghy while John and Sian snorkeled the caves. On Thursday we went outside to Staniel and anchored just to the west of the yacht club. 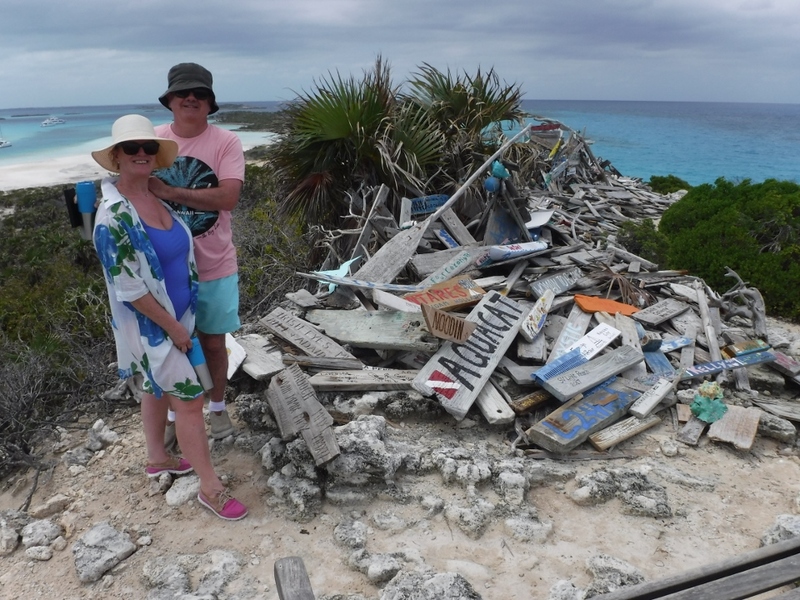 We took trash ashore and had a couple of beers as we watched the tour boat customers wade with the nurse sharks and rays. That night we went in to the yacht club for dinner. 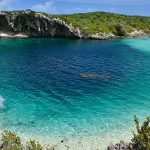 On Friday we snorkeled the sunken plane to the west of Staniel Cay and then Thunderball grotto. On the Saturday we started our run back towards Georgetown so that we would have our guests there in time for their flight on Wednesday 17th. Saturday’s plan was to anchor off Plain Beach just south of Black Point. The wind was stiff from the southwest blowing straight in to that anchorage with a swell. So we anchored at Black Point Settlement, and went into Lorraine’s Café for lunch. Early next morning, Mother’s Day, we lifted anchor and set off for Elizabeth Harbour again, a six hour run. When we got there we anchored right off the town and went ashore to see if anyone had picked up John’s sailing jacket, with no luck. 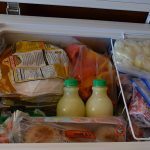 We had lunch at Peace and Plenty, got some provisions (including more milk!) before taking the boat over to Sand Dollar beach where we would spend a couple of nights. We made sure to have a couple of final drinks at Chat n Chill, and then on Tuesday we took Sonas over to The Marina at Emerald bay. 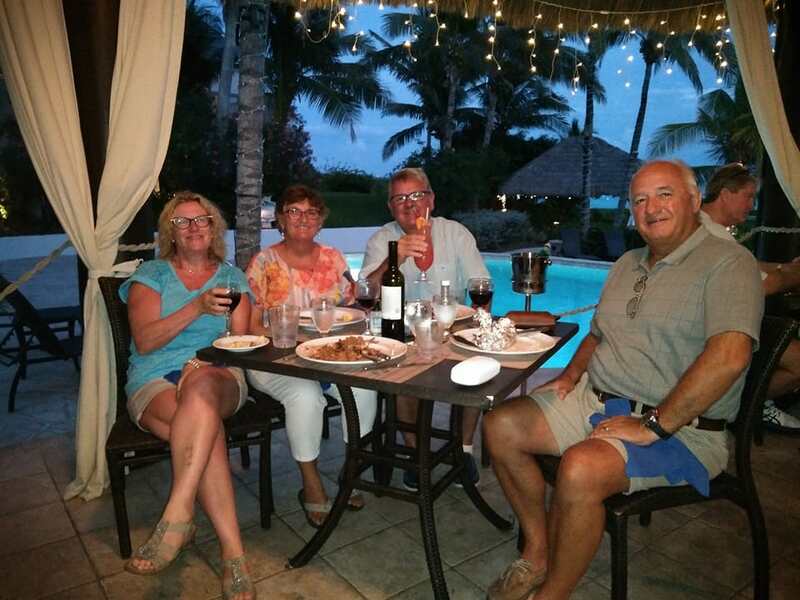 We had booked our final hurrah meal at the Pallapa restaurant in the Grand Isle Resort for Tuesday night. We had a really nice meal, a “few” cocktails and dancing to the live band. On Wednesday morning we had a sad farewell with John and AnneMarie at the marina after which we left immediately to start the journey back to Florida. The Irish Contingent Leave, slightly more tanned! Beautiful picture of you all at Pallapa! Enjoy!